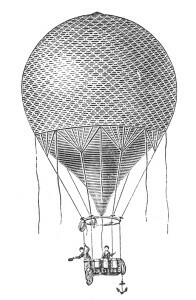 On the evening of July 9, 1905, Boston aeronaut William Canfield, and Mrs. Camille Stafford, were in a balloon over Lynn, Massachusetts, when it developed a leak and began to fall. Realizing that their combined weight was pulling the balloon downward to a certain crash, Canfield decided to jump using a parachute in order to lighten the weight so as to give Mrs. Canfield a better chance at survival. His decision was not a selfish one, for when he jumped the craft had dropped to 1,000 feet, which was generally considered too low for a parachute jump, and surviving the jump was doubtful. Therefore, he was willing to sacrifice his own life in order to save his passenger. But luck was with them. When Canfield jumped, a strong wind caught his parachute, but it sent him crashing into a house. Although seriously injured, he was alive. Mrs. Stafford stayed with the balloon, which landed safely about a mile away.